Just one week after our first donation, I am happy to report that Caudal‘s debut album Forever In Another World is also making profit. 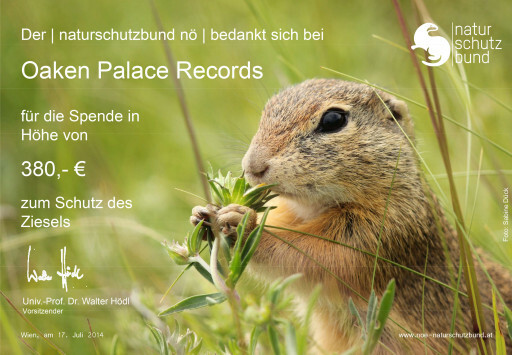 Our favourite kraut-droners have dedicated their album to the Ziesel (European ground squirrel), so we donated €380 (£300 / $515) to Zieselschutz, the protection fund of the Austrian Union for Nature Preservation. The money will be used to protect existing habitats, and to create new habitats for the Ziesel all over Austria. Following in the footsteps of Nadja’s Flipper, this means that every purchase of Forever In Another World via our webshop is equivalent to a donation of £12 (minus PayPal fees) to Zieselschutz. So go ahead and get a copy, if you don’t own one yet! And while you’re at it, make sure to get the Parallel Lines and Plurals LPs as well, so that we can soon start donating for polar bears and bees as well. Thanks again to all of you who support Oaken Palace Records!